I study biology in France and experiment on water filtration with plants. I found that some chlorophyll-containing micro-organisms (about 10 micrometers in length) were raised in my basin. I can't decide if this is a eukaryote (it looks like there are cellular compartments) or a prokaryote (it's very small!). 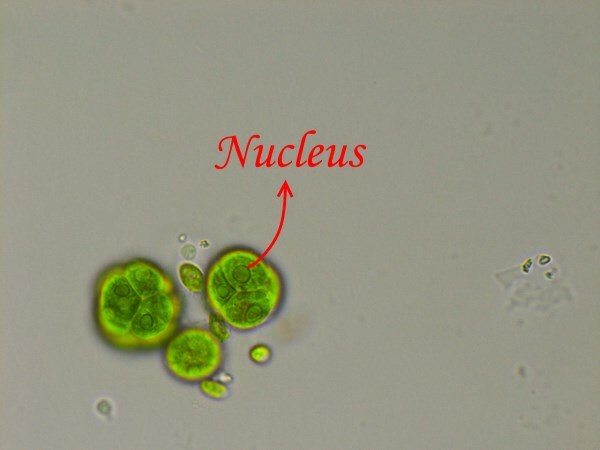 I thought it could also be a cyanobacterium, that combines features of both prokaryotes and eukaryotes. Any ideas what this is? I can't decide if it's a eukaryote or a prokaryote. In the image above, the arrow starts right on one of the nucleus of that group of (apparently) three cells. Besides that, despite some cyanobacteria being very long, 10µm is a lot for a prokaryote. The mean size of cyanobacteria is way less than that. 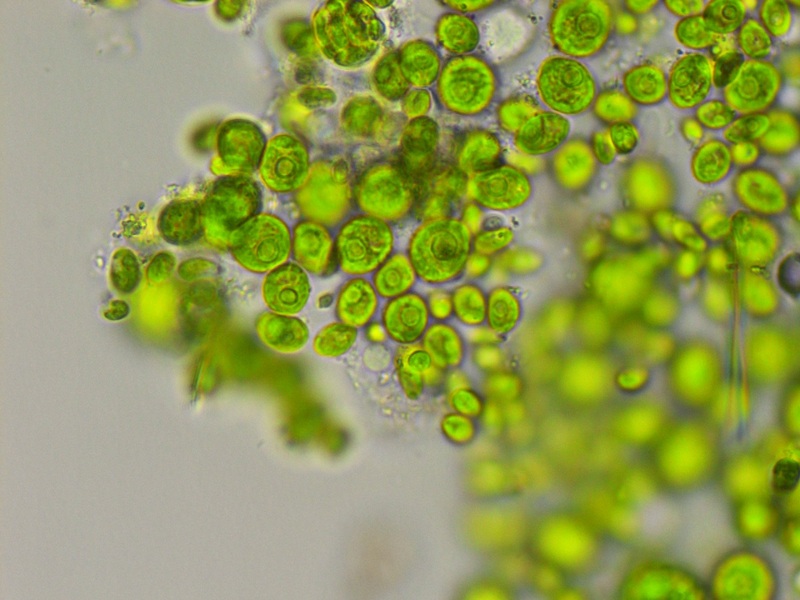 Doesn't make much sense, because cyanobacteria are prokaryotes. More precisely, they are Eubacteria prokaryotes. Finally, what eukaryoyte is this? I can't tell. 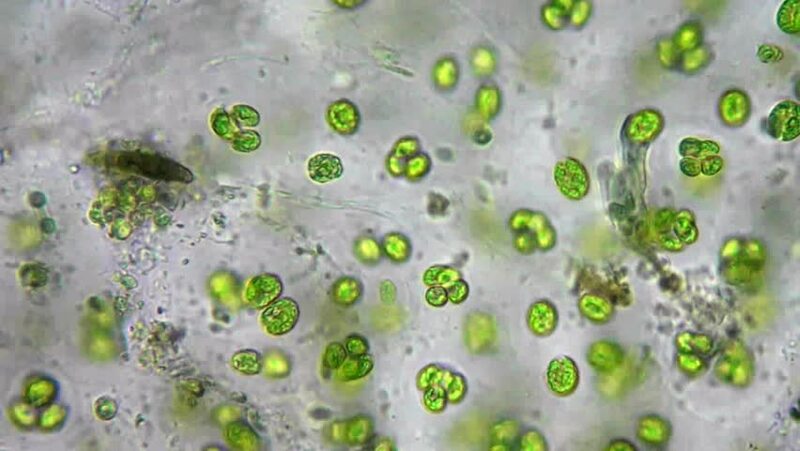 It's most probably a kind of Chlorophyta, but I'm not able to go to the Class level. If you're interested in identifying it, you can try a taxonomic key. This one is for British freshwater algal flora, I don't know how different French algae are from the british ones: The Freshwater Algal Flora of the British Isles: An Identification Guide to Freshwater and Terrestrial Algae. 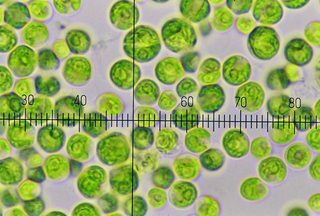 Also, have in mind that saying "that's an alga" doesn't help as well: worse than paraphyletic, algae is a polyphyletic group and, in biology, polyphyletic groups mean almost nothing. There are many kinds of algae. I couldn't tell you which one yours is. Not the answer you're looking for? Browse other questions tagged species-identification microbiology chloroplasts phycology or ask your own question. Organism identification, what is this? What is this salt-water worm? What is this aquatic organism in Fiji?